It was the fall of 1971 and we had transitioned from Beast to academics. From the relaxed atmosphere of Friday evening meals at Mitch’s to the toleration shown for “spirit” pranks, the football season provided a welcome diversion from the rigid discipline of our fourth class year. No game was more important than Army, and as that game neared, spirit approached a crescendo. The Dirty Dozen doolies decided it was the time for an outrageous demonstration of our enthusiasm. To set the stage, the basketball and volleyball courts in front of the gym were just being built. Construction materials, including a bulldozer and dump truck, were at the site. Next door, in front of the field house, was a Minuteman III missile on a trailer, waiting to be erected as a permanent display. Like any, this misadventure began with a comment, probably made in jest. In any event, when someone suggested that parking the missile in front of Mitchell Hall with a huge “BEAT ARMY” banner draped over it, we started planning a covert op. The major logistical challenge, getting the missile from the field house parking lot to the terrazzo by Mitch’s, seemed to have a simple solution: hook up the dump truck to the trailer and tow it up the hill. Recce determined the key was in the ignition, so after dinner Mike Greene stealthily slipped into the cab and...the engine wouldn’t start. For reasons lost over the years, Mike asked me about starting the truck. I knew about foot-operated starter switches and ended up in the cab starting the truck. The next thing we knew, I was directing him as he backed up to the trailer. Mike eased the truck out of the lot and started up the hill north of the dorms. Things went smoothly until Mike had to shift gears. When Mike let off the gas and put in the clutch to shift, the truck and trailer rolled back slightly. Every time he tried to let the clutch out, the engine stalled. After a few attempts, we realized the trailer had automatic brakes, which set each time the trailer rolled backward down the hill. I tried running from side to side releasing the brakes, but each time Mike tried to move up the hill, the rig rolled back and locked the brakes again. Eventually, the clutch went out. Now we were faced with a heavy cargo stuck halfway up the hill, and aimed at a parking lot full of Corvettes. Drastic times call for drastic measures, so I went back down to the construction site. I had never driven a bulldozer before, but through trial and error got the engine started, the blade up, and the tracks rolling. We chained the truck, trailer and missile to the rear of the dozer and tried to move up the hill. We quickly decided our effort was futile. Mike stayed in the truck with his foot on the brake while I headed back down the hill again, looking for something to chock the wheels. When I got back, there was a patrol car with lights flashing behind the missile. I E&E’d up to the passenger side of the cab, and Mike said we were busted. I asked if they had his name and he said, “No.” Mike rejected my suggestion that we could slip down the hill and get away, so I climbed in beside him, waiting for the cops to come back. Before long, we were in the back seat of the patrol car. After a short wait they came back and asked if one of us could move the bulldozer. None of the APs knew how. I was more than willing to show off my newly learned skills -- after all, I could be checking matchbooks for another career path very soon. Soon, we were brought to the police station and separated for interrogation. They weren’t nearly as good as the upperclassmen we would later face in SERE! The first thing the two men in my room did was read me my rights. I promptly replied that I didn’t think I needed a lawyer, since I didn’t appreciate how much trouble we were in. They put their heads together to confer, whispering. Then one repeated with emphasis, “You can have an attorney present.” I finally got the not-so-subtle hint and lawyered up. That ended the questioning and around daylight Mike and I were delivered to the custody of our very unhappy squadron commander. The fatigue and excitement dulled my recollection of the morning that followed. The weight of the charges, two counts of civilian grand larceny for the truck and the bulldozer, and misappropriations of $2.5 million for the missile, settled in. God must have a sense of humor though, because a visiting dignitary granted us amnesty during the noon meal. 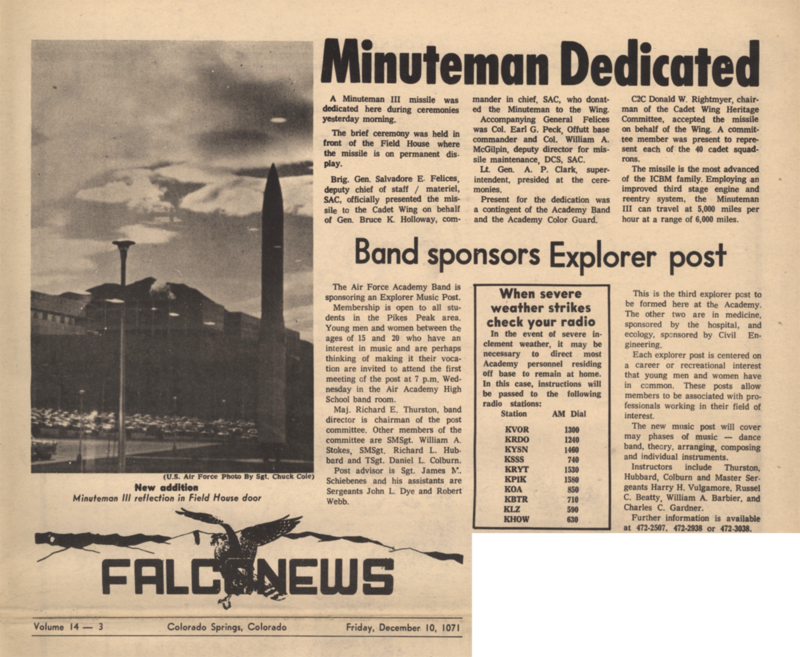 This is my honest recollection, without exaggeration, of the events surrounding the infamous Minuteman Missile incident. Obviously, I was not aware of everything going on around us that night, but I’m pretty sure Mike Greene and I were the only two arrested. Each time I visit the Zoo I smile when I gaze at that impressive monument to cadet ingenuity and remember the good times we shared.